April 2, 2017 April 12, 2019 - The 'Noms. 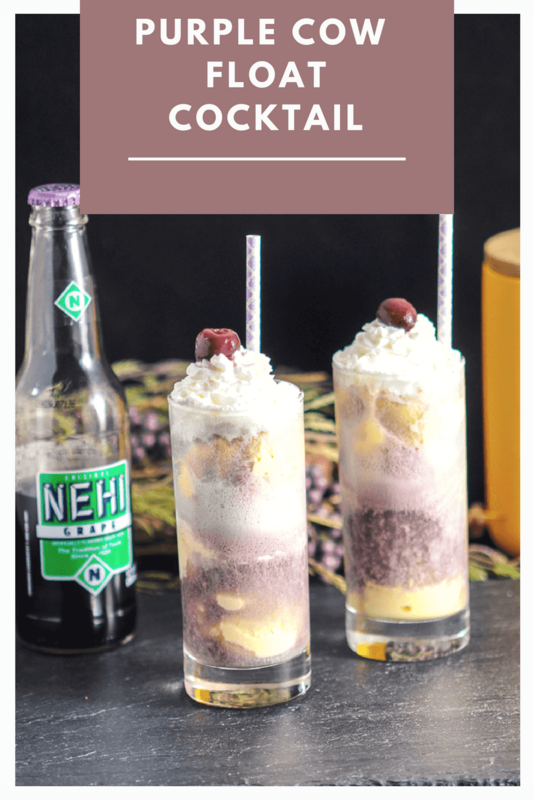 A boozy version of the kid’s classic Purple Cow Float! There are many flavors that can take you right back to your childhood, be it that cookie your grandma made, your favorite candy, or a treat. One treat for Leah was the Purple Cow. 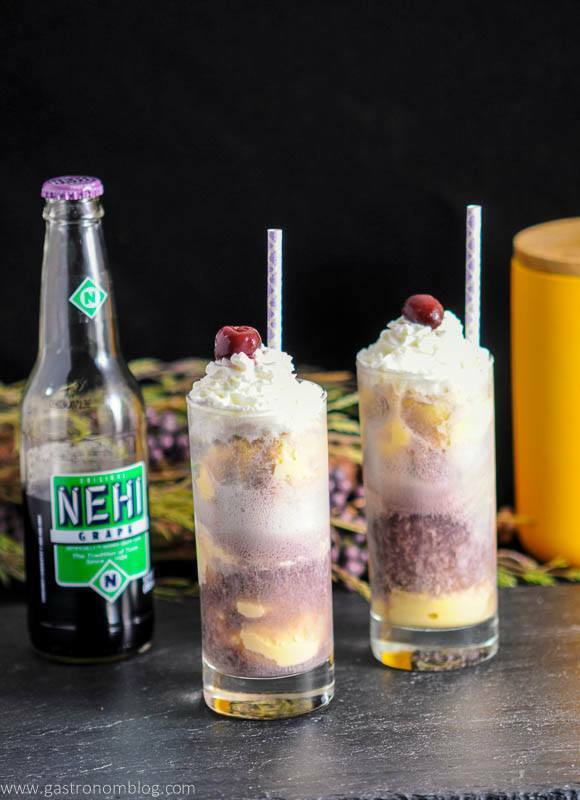 It’s a soda float made with vanilla ice cream and grape Nehi soda that was famous at soda fountains all across the Midwest. What if we recaptured that childhood flavor but added a definite adult edge and made an Adult Purple Cow? We took a little road trip recently and at one of our stops we needed a little refreshment. That’s when we saw we had the chance to hit an old fashioned soda fountain where they had all kinds of vintage sodas. One of those sodas was Nehi Grape, which is classic soda that has been around since the 1920’s and was the choice of Radar O’Reilly in the show M*A*S*H*! 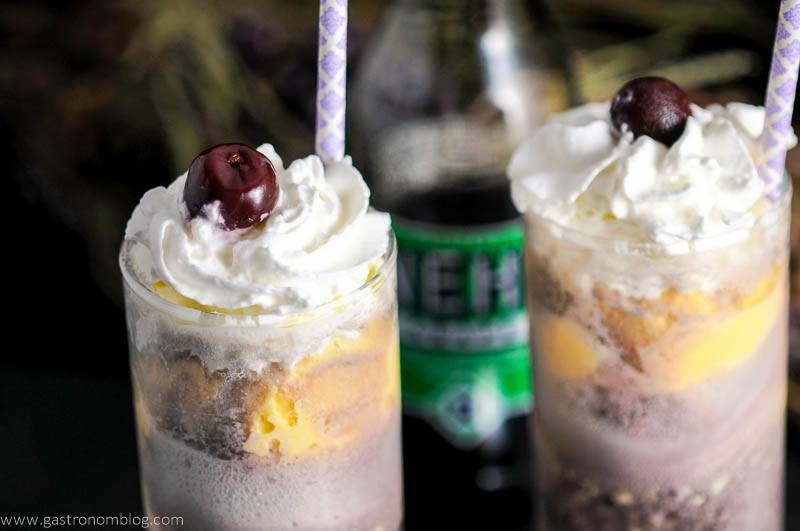 Drinking a Nehi Grape is like taking a trip back to your childhood, rolling down the sidewalk on your bike, watching fireflies on a hot summer night or spending the whole day outside with your friends! Nehi Grape tastes like you think the color purple might taste. It’s apologetically candy sweet and kind of artificial grape flavored, this soda tastes totally vintage like the glass bottles with the old fashioned letters that looks like something you might find in your grandma’s icebox. 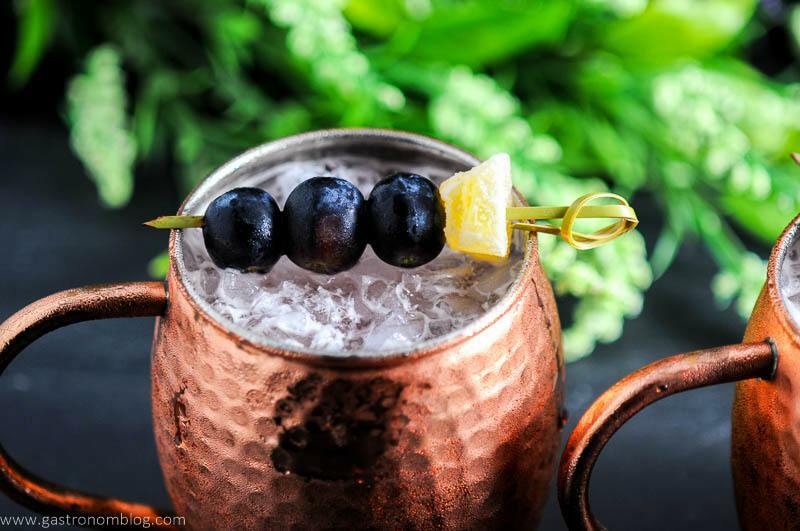 If You are Looking for More Vodka Cocktails, Try These! 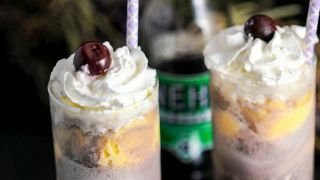 While this old fashioned soda might not have the most authentic natural flavor, it is really fantastic when mixed with vanilla ice cream to make a float. 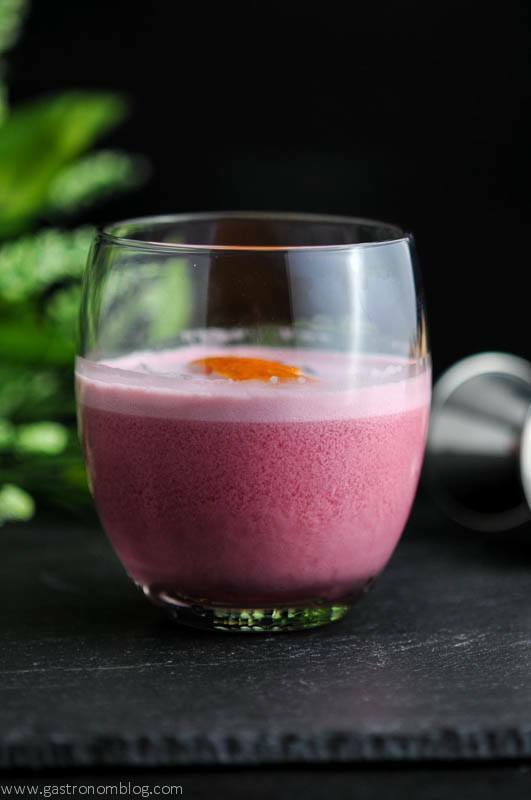 The sweet soda mixes with the creamy vanilla and makes a delicious lavender colored foam. The foam tastes like a grape creamsicle known as the Purple Cow float. 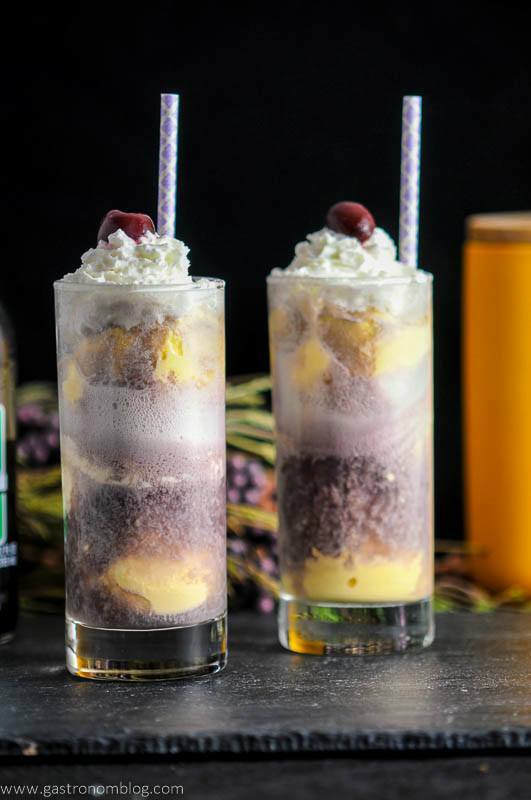 What Ingredients are Needed for the Purple Cow Float? Being cocktail bloggers, it is only natural that we added a little boozy component to this creamy sweet treat. You know we love boozy desserts! We decided not to mess with the classic flavor of the Purple Cow, so we decided to go with vodka, a spirit that is relatively unflavored. 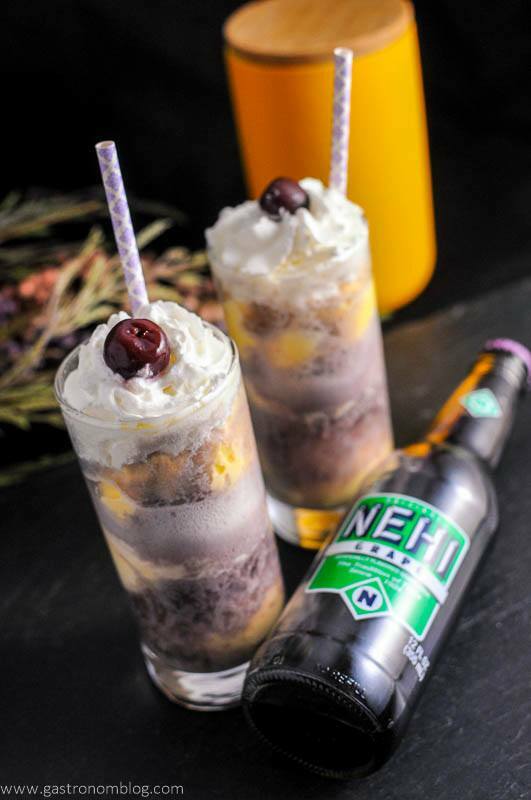 The sweetness of the Nehi Grape helps cut any burn from the vodka that might have been present. This makes this a prefect boozy float! Leave out the vodka and the kids can have the same drink as you! We topped the whole float with some whipped cream and put a cherry on top! One of our brandied cherries of course! This brings the whole treat together! 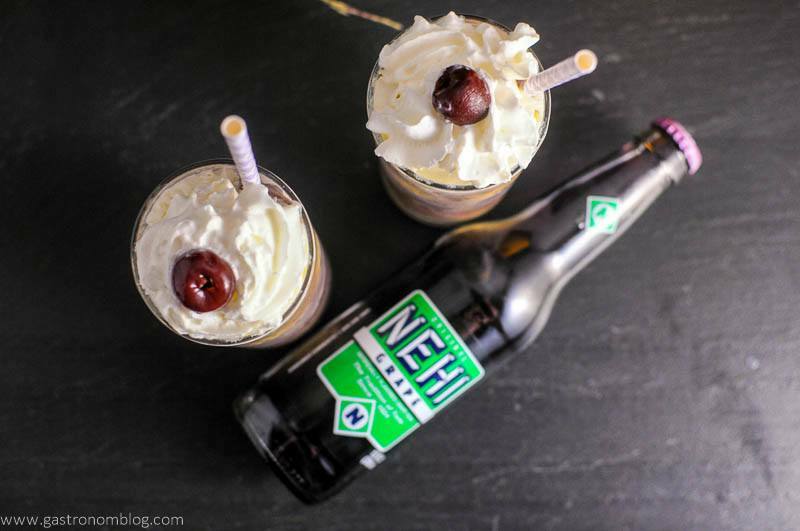 A childhood favorite has been turned into an adult favorite with vodka and Grape Nehi soda. Add the ice cream to a tall glass. Top with Grape Nehi soda. 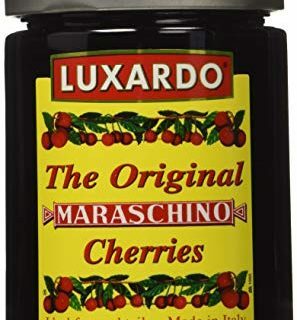 Garnish with whipped cream and a brandied cherry. PIN THIS ADULT PURPLE COW RECIPE FOR LATER! Pinning this and trying later! Yummmy! This looks so good 🙂 I cant wait to try this. John would LOVE this beverage. I remember Nehi. 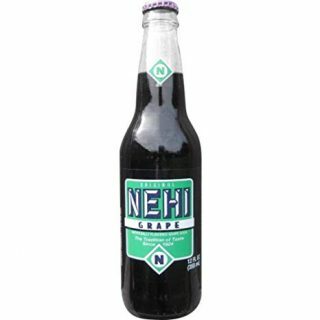 We were allowed one pop a week and Grape Nehi was a favorite. It was always a treat! Not something I’ve ever tried before, looks interesting. this sounds great! i’ve never tried nehi brands! i’m going to have to get some now! Ha, thanks! We love this one! Holw Cow this looks amazing! Such a fun treat! Oh wow! It’s a rare treat when I find a place that sells Nehi (I’m a fan of their peach soda) but next time I find such a place I’ll have to snag a grape Nehi and try this! I’ve never had a grape Nehi, but I can’t see or hear the name without thinking fondly back to sweet Radar! I loved that show- I’d drink this even though I don’t really drink soda, just to feel nostalgic haha. What an awesome idea! LOL, Radar is the best! We don’t drink soda very often, but we saw this in the store and knew we had to do something with it! Brilliant idea! I haven’t had grape soda in ages! This cocktail sounds fabulous! Thanks so much! It was fun to reminisce! I love how this looks! The cherry on top is so cute too, I bet this tastes so good! Thanks so much! We loved this one! This is such a fun idea! It’s pretty to look at and I bet it tastes dangerously delicious. I can’t wait to try it! I remember loving grape soda as a kid. What a fun twist on a childhood favorite! Thanks, it was always such a treat as a kid! Why not as an adult! This looks delicious! My sister would have loved this drink! She was a grape soda fanatic! Aw, what a great memory of your sister! Food memories are the best! This reminds me of the movie Now and Then. Pretty sure Jeanine Garafalo serves them a purple cow in the movie. This looks super good. Haha, I think so too! Thanks! Yum! Count me in! A Purple Cow is such a good dessert, but add a little vodka and that puts it over the top. Right?! We thought it was so yummy! I’ve never heard of a purple cow before — but you mentioned tastes from childhood — which reminds me of the black cow my grandmother used to make for me with ice cream, chocolate sauce and coca-cola. Those are some good memories, but now it appears time to make some grown-up ones! This sounds delicious! Yes, I always love memories like this one! This is someone reminiscent of this, too! Thank you! This is such a fun recipe! I have never had this before, but it sounds SO fun! Definitely need to try this! Thanks so much! 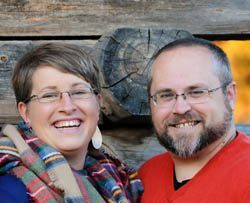 We had fun with this one! Oh I love this recipe! We used to make the kid-version of these floats when I was young and I had forgotten about them completely. They are delicious! So what a great idea you have going on here. The addition of vodka makes it even more tempting. YUM!